By this point, everyone who has spent time working in IT service management (ITSM) should have heard of ITIL. Formerly known as the ‘Information Technology Infrastructure Library’, ITIL has set a global standard for ITSM for going on three decades, attracting a booming community of certified practitioners along the way. The ITIL Service Lifecycle paints a holistic picture of how to plan, create, release and continually improve IT-enabled services, both for internal users and customers. At the same time, it encourages a consistent emphasis on aligning ITSM with larger business goals and requirements. This ensures that no time is wasted on non-essential tasks, helping ITIL-powered teams to release higher-quality services at a faster rate. IT has gone from being just another optional tool for organizations to take advantage of to becoming the very lifeblood of modern business. Everything from customer service to basic retail now relies on IT in some way, and this has been reflected in the changing content of the ITIL framework. Back in 2017, AXELOS announced the release of the newest iteration of the framework, ITIL 4. This would be the first major overhaul for ITIL since 2007 and would keep the advantages of ITIL v3 while also introducing updates to address the biggest concerns held by practitioners. Even so, it is important to be able to focus on the biggest benefits of ITIL at an organizational level, rather than focusing solely on ITSM professionals. Why should executives who are focused on brass-tacks bottom-line considerations invest in the framework? What are the advantages of ITIL for businesses? Unfortunately, the primary goal of ITIL is not to decrease an organization’s ITSM spending. Rather, it is about maximizing the value of ITSM practices by making them more constructive, streamlined and supportive when it comes to pursuing crucial business goals. While this should allow you to trim the fat where you find it, the main financial benefit of using ITIL 4 will be a greater return on your investment. With services of a higher standard, an atmosphere of continuous improvement and faster response times for dealing with any issues that appear, you should see a boost not only in your customer satisfaction scores, but also your profits. Investing in a top-tier ITIL course with a solid LMS platform may seem steep in the short term, but it is important to keep the long term benefits in mind. Reduced development times, higher-quality products and streamlined fault resolution can all lead to higher profits, as well as lower expenditure once non-essential and wasteful practices are removed from your service development cycle. With ITIL 4, however, your investment will also have the benefit of future-proofing your ITSM practices. ITIL 4 holds the unique advantage of being community-driven, with a worldwide collection of practitioners set to continually troubleshoot and suggest improvements for the framework. This will keep ITIL 4 in touch with the ever-evolving world of ITSM, equipping users to take advantage of future changes to technology and IT service management practices. In short, investing in corporate ITIL 4 training now will allow you to continually benefit from the niche knowledge and experience of the practitioner community. This, in turn, will ensure that you will not need to keep continually reinvesting in future training down the line, unless you want your employees to continue further on the ITIL 4 certification path. After more than ten years, ITIL v3 earned its fair share of criticism. One of the most common issues was that it was becoming increasingly out of touch with the greater ITSM community, particularly when it came to compatibility with other frameworks. The problem is not simply that ITIL isn’t the only game in town, but that alternative frameworks cover different aspects of ITSM. DevOps, for example, has much more of a focus on human elements in the IT service management process. In theory, combining DevOps with ITIL would create a more holistic approach to management overall, but it is only with the latest ITIL update that this synthesis has been actively encouraged. Indeed, when ITIL 4 was announced, AXELOS quickly stated that it would be compatible with other ITSM processes and frameworks, including DevOps, Lean and Agile. If your organization is already using an ITSM standard, you should have no trouble integrating it with the latest version of ITIL. Speed is key in any business or industry, whether in delivering services, repairing errors or taking advantage of new opportunities. This is essential for maintaining a market share, as well as customer satisfaction rates. Having efficient ITSM practices in place is crucial for this. One of the biggest ITIL benefits is that it emphasizes streamlined development and incident management without sacrificing service quality. By predicting and reacting to potential issues before they can become major problems, your team can ensure that services are released with fewer risks. This, in turn, will help you avoid costly periods of downtime, along with the resulting customer complaints. Remember, it is important to take the initiative when it comes to problem management. Embarrassing errors can quickly turn into PR disasters in the current digital age, and there are always competitors ready to offer alternatives to inferior services. A lack of communication between teams can often result in siloed thinking, even within IT departments. Everyone from the development teams to the service desk can end up focusing solely on their own targets and KPIs rather than larger business needs. As a result, departments will often experience delays, a startling lack of objectivity and incessant finger-pointing whenever something goes wrong. Poor alignment between business and IT can lead to serious setbacks in planning, developing, releasing and improving products. At the same time, poor awareness of an IT department’s capabilities can result in unrealistic expectations and targets, as well as a lack of support from higher-ups. ITIL 4 ensures that the requirements of IT and business remain aligned, helping actors on both sides to work in tandem. It encourages organizations to treat IT departments as IT service providers, complete with specified roles, priorities and targets. This clarity and accountability can make it much easier for IT teams to progress towards key goals, such as earlier release dates, faster complaint resolution services or simply adding new features. Consider the most popular digital services in the world, such as Facebook and Google. Did they get where they are by remaining static, or are they always looking for ways to streamline and modernize their offerings? Remember, this commitment to continual service improvement will have a wonderful effect on customer retention. At the same time, it will also leave you flexible enough to embrace positive change whenever an opportunity appears. This will allow you to stay on top of competitors and continually take the initiative to offer the best quality services in your market. It can often be a hassle to organize corporate training. Having to take full-time staff away from their desks for study, potentially for several days at a time, can cause serious reductions in productivity, especially where higher-level managers and executives are concerned. However, the growth of the online training industry has made it easier than ever to gain ITIL certifications. Companies can avoid having to hire instructors, book classrooms or pay for commuting. Instead, employees can access training online, typically via any electronic device with an internet connection. Indeed, mobile accessibility has become a huge feature in recent years, largely because so many people now have access to laptops, tablets and smartphones. Students can access learning materials anywhere or at any time, even if they only have a few minutes to spare between meeting. This can make studying far less disruptive, allowing employers to enjoy the benefits of corporate training with fewer drawbacks. Providers like Good e-Learning even offer months of access, making it easy for busy students to stagger their training. More importantly, students of ITIL 4 do not need to pursue full certifications all at once. Once they have earned an ITIL 4 Foundation certification, students can choose modules in the ITIL Managing Professional (MP) or ITIL Strategic Leader (SL) paths, depending on what is most relevant for them. Students certified in ITIL v3 can even take the ITIL Managing Professional Transition module to update their knowledge without having to start from scratch. In short, not only can employees easily fit ITIL training into full-time schedules, but they can also pick and choose ITIL topics without having to waste time on irrelevant modules. Why Study ITIL 4 with Good e-Learning? Good e-Learning is an award-winning online course provider which covers many of the world’s most popular corporate standards and frameworks, including ITIL, TOGAF, Lean and Six Sigma. Our in-house team of experts allows us to offer top-tier courses at a fraction of the usual price, and with 3,000 active learners, 250 global clients and 90% repeat business, our figures speak for themselves! Being so familiar with the ITIL framework, we began preparing for ITIL 4 as soon as it was announced, and our new course provides excellent guidance on the latest iteration of the world’s most popular ITSM framework. Get ahead of the competition and learn ITIL 4 with our new ITIL 4 Foundation course today! We work to make our offering as convenient as possible for students in full-time work. Not only do we offer full-mobile accessibility, but we also provide 24/7 tutor support, ensuring that students can get help whenever they need it. At the same time, we also work to provide engaging and varied training assets, including gamified quizzes, interactive videos and motion graphics. 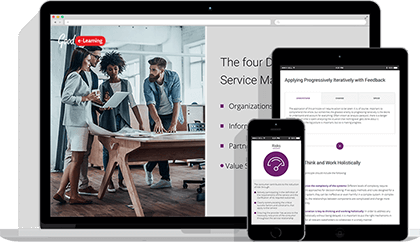 Our world-class LMS, the Learning Ecosystem, can be fully customized to meet the requirements of your organization. As well as hosting any training assets you choose to include, regardless of format, it can also automatically track your users and report on their progress. Once you see the real value of ITIL 4, you may even choose to become a reseller and offer our courses to your own clients, all at zero cost to you! Best of all, our courses can be accessed via multiple devices. Whether you are traveling, killing time or just sat at your desk, you can continue your studies whenever it is convenient for you.